Posted on September 17, 2014 by Al B. Please join us for a free evening event featuring guest speakers Dr. Simone Alin, Supervisory Oceanographer at NOAA Pacific Marine Environmental Lab; and Betsy Peabody, the Director of Puget Sound Restoration Fund. You’ll learn about changes in the marine waters of Puget Sound, and what’s being done to address them by some of the amazing people who live and work here. 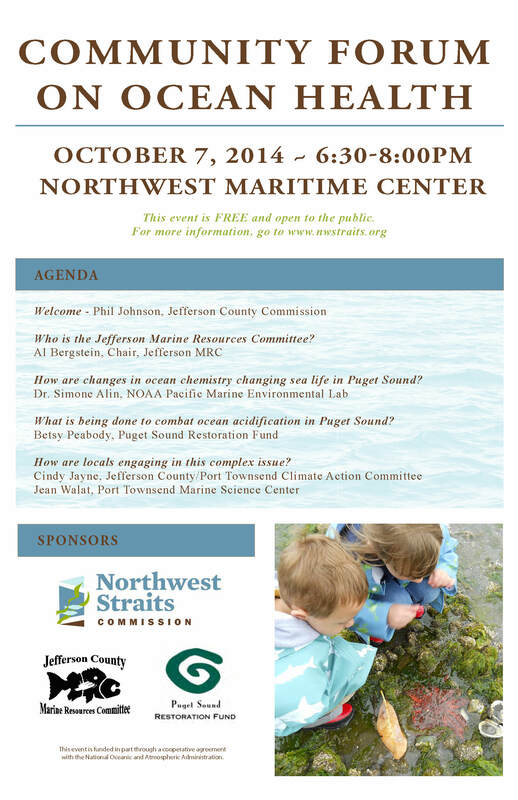 This event is sponsored by the Northwest Straits Commission, Jefferson County Marine Resources Committee (MRC), and Puget Sound Restoration Fund. Posted on July 19, 2013 by Al B.
NOSC is also hiring an “Education and Outreach Assistant” WCC Individual Placement Intern and 5 WCC Crew Members for October 2013-September 2014. Description: This position assists in leading a service learning education program, looks over a native plant nursery, runs summer chum and Coho spawner surveys, helps with monitoring on current and past NOSC projects, and assists with volunteer coordination and producing outreach materials. Description: This crew is based in Port Hadlock, working for the North Olympic Salmon Coalition (NOSC). NOSC is one of 14 Regional Fisheries Enhancement Groups (RFEGs) in the state of Washington. The crew implements projects for NOSC and partnering organizations, such as conservation districts, other RFEGs, Tribes, land trusts and WDFW. Projects primarily consist of riparian/estuarine restoration which involves; native plantings, noxious weed control and site maintenance (includes brush cutting, mowing, and herbicide application). Corps members will be expected to test for a Washington State Pesticide Applicator License. The crew will occasionally assist with salmonid and habitat monitoring. The work week is generally Monday-Thursday, 7:00AM-5:30PM. View the crew’s blog. To apply for this opportunity visit the WCC website and select CREW- PORT HADLOCK/NORTH OLYMPIC SALMON COALITION on WCC’s online job application. NatureBridge still has a few open spots for the Summer Field Research Course at its Olympic National Park campus. This two-week immersive backcountry expedition will give high school students the opportunity to conduct rigorous field science investigations in one of the most ecologically diverse national parks in the country. Modeled on the successful program at NatureBridge’s Yosemite campus, the course offers an intensive teen summer science adventure. High school students will work with National Park Service scientists, using cutting-edge technology to produce their own ecological research project. The research will be included with a backpacking trip across the Olympic Mountains and ending at the Elwha River, where the largest dam removal in U.S. history is underway. “We appreciate the many opportunities that NatureBridge provides for students and youth to learn about Olympic National Park,” added Olympic National Park Superintendent Sarah Creachbaum. The Summer Field Research Course will take place July 14-26, 2013. Students interested in the program are encouraged to contact NatureBridge at 206-382-6212 extension 13 or olympicfieldresearch@naturebridge.org or register online at naturebridge.org/discoversummer. Founded in 1971, NatureBridge provides environmental field science education for students in the world’s best classrooms—our national parks. Through residential education programs, NatureBridge connects students to the wonder and science of nature and inspires the stewards of tomorrow. As the largest residential education partner of the National Park Service, the organization serves more than 30,000 students each year and offers programs in six national parks: Yosemite National Park, Golden Gate National Recreation Area, Olympic National Park, Santa Monica Mountains National Recreation Area, Channel Islands National Park, and Prince William Forest Park. NatureBridge also offers professional development opportunities for teachers and family and youth programs. NatureBridge is a 501(c)(3) nonprofit organization. More information is available at www.naturebridge.org.